Cushion unfoiled glass cabochons in ovals and/or rectangels alternate on bracelet, brooch. Goldplated brass, all stones bezelset. Only mysterious mark is the numeral 8 repeated on the pin and on the ring. Quality workmanship, never worn, like new condition. C:a 1950s-1960s. Sizes: Bracelet 7 1/4" L, 3/4" W, Pin 2" W, Earrings with adjustable screwbacks 1 1/2" long approx. Adjustable ring, oval f. goldstone 3/4" H approx. 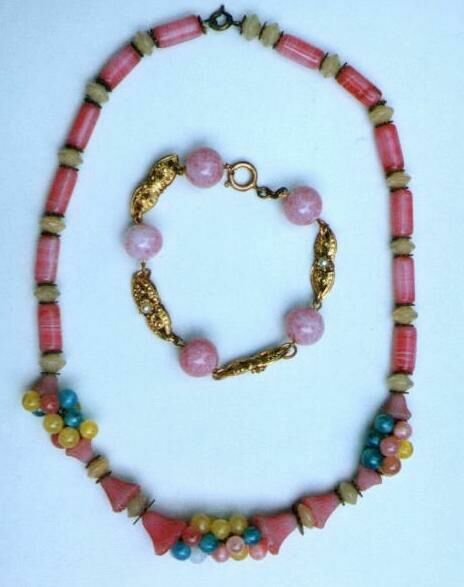 Glass beads in pinks, greens, yellows grouped like fruit in triple front motif, tube side beads contrasting spacers. Bracelet with pink glass beads and goldplated filigree brass stations goes with. Highest fashion value in wood beads in all the wild colors of the 1960s, tassel earrings for pierced ears, one shown pinned to dress above. Includes matching bead bracelet strung on elastic, not shown. 1960's revival style probably made in the 1990s. Size: 30" L, earrings 2 3/4" drop. Order from PayPal shopping cart button in descriptions or email Liz Collectible Jewelry for confirmation and payment method, see Information for site policy. Please note Style Number of your selections in your email.